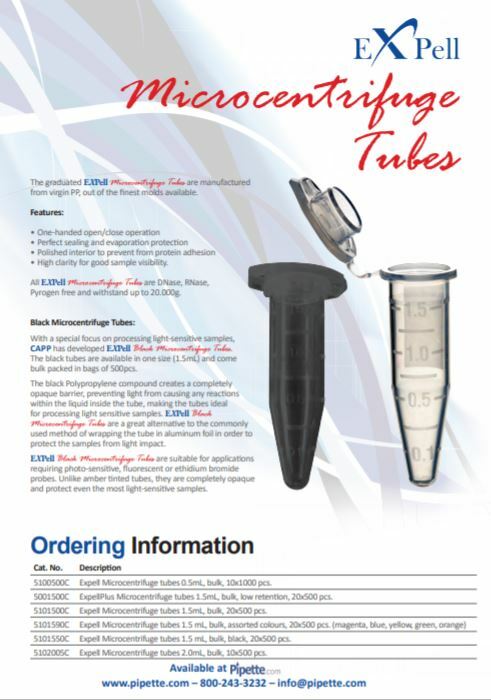 Capp Expell Microcentrifuge Tubes provide stability for all of your centrifugation protocols and requirements. All Capp Expell Microcentrifuge Tubes are certified to be sterile, DNase, RNase, Pyrogen Free and withstand up to 20,000 x g. CAPP Expell Microcentrifuge Tubes are manufactured from 100% virgin polypropylene (PP). Capp Expell Microcentrifuge Tubes are graduated microcentrifuge tubes that are available in 3 volume sizes: 0.5 mL, 1.5 mL, and 2.0 mL. Capp Expell Microcentrifuge Tubes are manufactured in high-quality molds for consistently faithful products without blemish or inconsistency. CAPP Expell Microcentrifuge Tubes, along with the Capp Rondo Microcentrifuge (CR-68X), are an ideal centrifugation solution from CAPP for your lab. 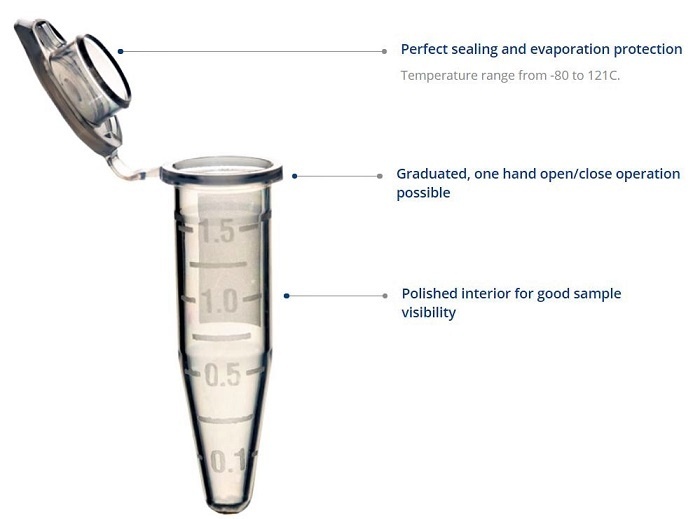 The main features of CAPP Expell sterile microcentrifuge tubes are one-handed opening and closing of tubes, perfect sealing and evaporation protection as well as a polished interior to prevent protein adhesion to the tube. CAPP Expell sterile microcentrifuge tubes also offer high clarity for optimal sample visibility. 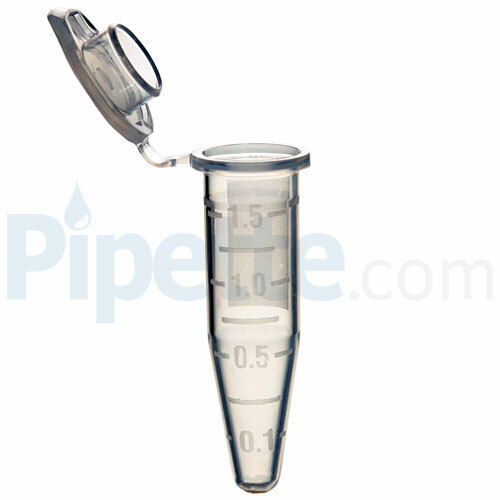 These tubes are compatible with all known centrifuges on the market. Withstand temperatures from -80°C to +121°C. Fits all standard and high capacity centrifuge rotors. Supplied in double safety self-standing bulk bags. Can be centrifuged up to 20,000x g.
Provide stability for all of your centrifugation protocols and requirements. 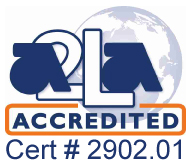 Certified to be sterile, DNase, RNase, Pyrogen Free. Manufactured from 100% virgin polypropylene (PP). Available in 3 volume sizes: 0.5 mL, 1.5 mL, and 2.0 mL. Manufactured in high-quality molds for consistently faithful products without blemish or inconsistency. 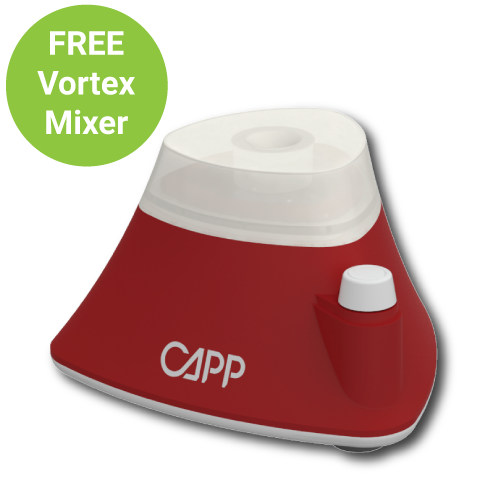 Partner great with the Capp Rondo Microcentrifuge (CR-68X). One-handed opening and closing of tubes. Polished interior to prevent protein adhesion to the tube. Provide high clarity for optimal sample visibility.